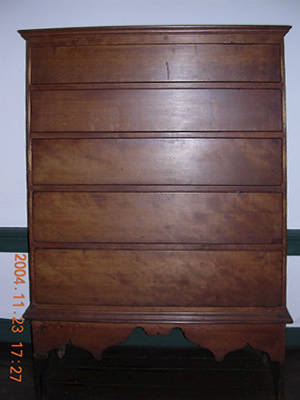 Cherry Queen Anne tall chest with scrolled skirt, never bored for hardware, Connecticut, circa 1750. 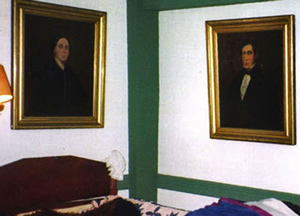 Pair of oil on canvas portraits of Caroline Augusta Peene and Joseph Peene. At 1:00 in the afternoon of the second Monday in June, 1824, a group of Newtown Village residents gathered at the tavern of Czar Keeler located diagonally across from the site of the present Edmond Town Hall. In the previous month the State General Assembly had granted the petition of a number of these residents asking to be incorporated as a borough, and now the villagers were meeting for the first time to set up the organization, draw up by-laws for the new political entity, and elect their first officers. The idea of a borough was not new. Bridgeport had been incorporated as the first one in the state twenty four years before, but it was unusual in a small rural town. Its purpose was simply to establish a political entity which could handle the special needs of the Village. With its greater population density than the rest of the town, the Village needed special services from which the rest of the town would not benefit and therefore was unwilling to finance. With its incorporation, the Borough become a legal person with the power to buy and sell real estate, enter into contracts, build roads, develop other public works projects, and, most importantly, tax itself to pay for all of this. The residents of the Borough remained citizens of the town of Newtown and took part in all of the town's political activities but they benefited from their own special services, which went beyond those that the town supplied to all of its citizens. Although it was a political entity similar to a town, it could not send representatives to the General Assembly or otherwise take part in state politics. This had to be done through the town at large. Over the years, then, the Borough has provided numerous benefits for the Village, often long before similar benefits were supplied to the town in general. In 1883, for example, the Borough provided the town with its first hook and ladder fire truck. In 1907, in addition to enlarging its boundaries to their present extent, it contracted with the Newtown Water Company to provide the Village with fire hydrants. Eight years later it negotiated with CL&P for the first street lights in town. As early as 1931, the Borough saw the need to control growth in the Village and passed its first zoning regulations. It would be another quarter century before the town would follow its lead. The Borough has had a quiet but vital history as for over a century and a half it has supplied first the Village and then the town with essential services and leadership.